We had our first butterfly break free from its cocoon today. We were so glad that our friend Ethan brought in caterpillars for us to see. Only the brave held the caterpillars. Here are a few of our brave ones. Even if they didn't want to hold the caterpillars they still all got the chance to look at them. We were thrilled when Miss Tennessee stopped by to say hi to our class. We learned that she is from Tennessee. She gets to wear a crown like a princess for 1 year. Talking with the children about where they live? We have been talking about bugs and creepy crawlers and reading many stories. One story we read was the very hungry caterpillar by Eric Carle. To expand on our reading of the story we made edible caterpillars by pulling apart cinnamon rolls, twisting them and adding raisin eyes. Yummy! Our very hungry cinnamon roll caterpillars. twisting the away to make the caterpillars. 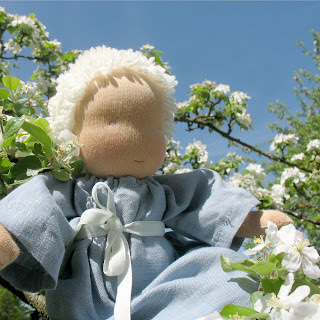 I made this Doll surrounded by the fragrance of apple blossoms and lots of birds singing around me. First up...Daring Bakers -- The April 2009 challenge is hosted by Jenny from Jenny Bakes. She has chosen Abbey's Infamous Cheesecake as the challenge. Thank you, Jenny! 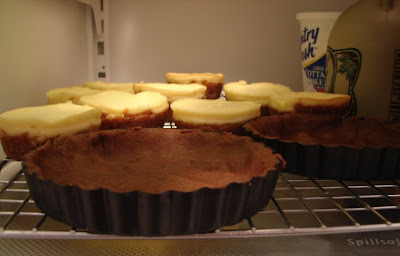 I did mini cheesecakes in a muffin tin and they turned out lovely. One itty bitty problem I had with the recipe was that there is quite a bit of butter in the crust and that was kind of tricky to deal with after baking, it was kind of gooey at first, and then when the extra butter cooled, it hardened and stuck to the pan and cooling rack, not a big deal though. My only substitution in the recipe was to use sour cream instead of heavy cream -- nothing against you heavy cream, please don't worry, sour cream will never replace you in alfredo, but I wanted that extra little tang from sour cream in the cheesecakes. 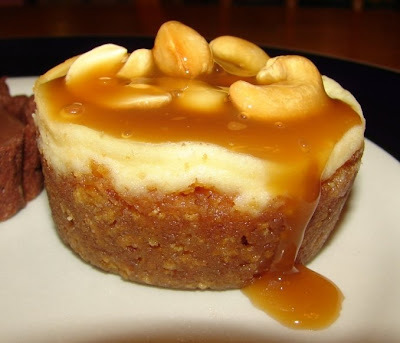 For my topping I did a salted caramel sauce with cashews, I can't remember where I first saw a caramel cashew cheesecake, I think it was a Taste of Home recipe -- or possibly a restaurant menu...either way, it turned out delicious! On to TWD... I was of course a little nervous about the chocolate pastry cream but it turned out lovely. My substitutions in this recipe include using skim milk instead of whole and to using semisweet chocolate. 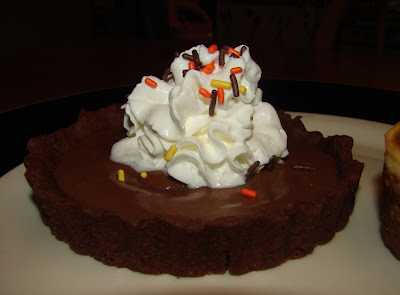 This was a wow dessert, I didn't expect to really like it, but when it's all put together -- the chocolate tart crust, the chocolate cream, the whipped cream on top -- this is one amazing little chocolate number! I think I'm safe saying this is my favorite chocolate treat we've made with TWD. Wait, I forgot about those chocolate cupcakes last October, this might be a tie. Chocolate isn't my favorite 'flavor,' but I did completely fall in love with this tart, I think a lot of that had to do with the fact that I used semisweet instead of bittersweet chocolate. 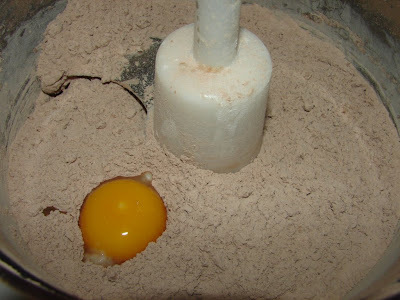 I've tried quite a few recipes with bittersweet chocolate and it's just not for me, I guess I'm not 'grown-up' enough :) Below photo is the crust being prepared in the food processor, I found that I needed to add a few tablespoons of water to get the crust to a proper consistency. Yum! Thank you for visiting! This week for Sweet Melissa Sundays, Jessica of A Singleton in the Kitchen picked Granola Breakfast Cookies for us to try. 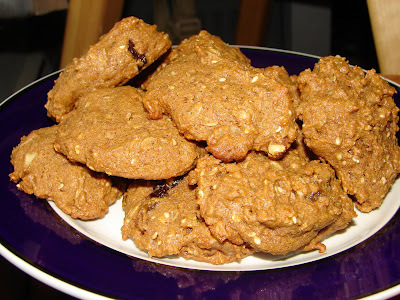 The recipe for these cookies uses another recipe in The Sweet Melissa Baking Book, Cherry Almond Granola. 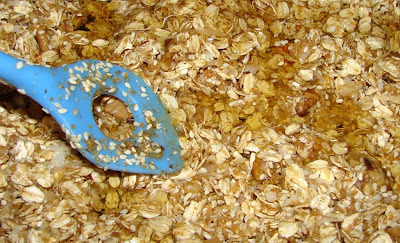 That granola sounds delicious but has a few ingredients that I could not find locally, so I decided to try a granola recipe I noticed at The Michigan Maply Syrup Association site for Maple Walnut Granola. 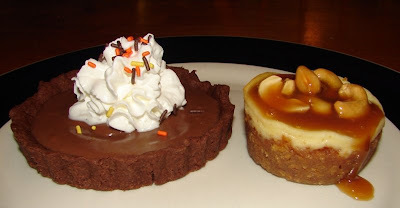 I had been browsing maple syrup recipes since we have a TON of maple syrup and I wanted some new ideas to use it with. 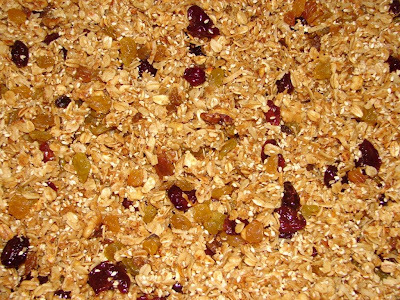 I like to make my own granola and am always up for a new recipe. Granola is a really simple snack to make, and to make it even easier I use a tabletop roaster oven -- those big ones that are for sale everywhere around Thanksgiving, that rarely get used after Thanksgiving. I love to use it for making double batches of Chex Mix for my husband (his favorite treat), granola, and anything else that needs to be baked at a low temperature for a long time and stirred throughout baking. Preheat oven to 250 degrees. 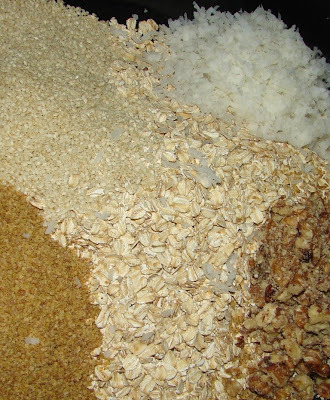 Combine oats, wheat germ, sesame seeds, coconut and nuts. Add oil and stir until evenly distributed. Pour in maple syrup, stirring well. Add honey and mix until well moistened and mixture is crumbly and sticky. Spread in a large shallow pan. Bake 1 1/2 hours, stirring occasionally for even browning until mixture is golden brown and dry. Cool and store in airtight container. That's it for the granola, really easy! You can find the cookie recipe on Jessica's beautiful site -- A Singleton in the Kitchen, give it a try, I hope you will love it as much as we did! My only change to the recipe was to add 1 teaspoon vanilla. 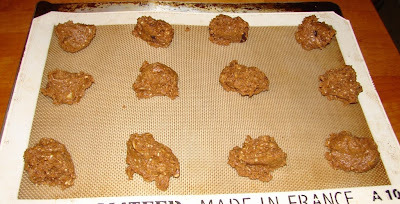 Baking them on insulated cookie sheets will make sure they stay soft and chewy. These cookies were really easy to make, but a little difficult to photograph, they aren't the prettiest cookies, but they sure are delicious! 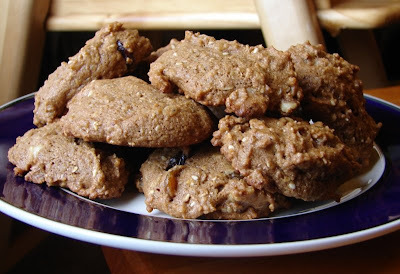 How could you go wrong with whole wheat flour, dried fruits, coconut, wheat germ, oats, walnuts, and sweetened by Mother Nature with molasses, honey, and lovely maple syrup? Time for My Kitchen My World's second country for April -- Turkey! There are so many delicious sounding Turkish recipes on the internet that I had a hard time deciding what to make. 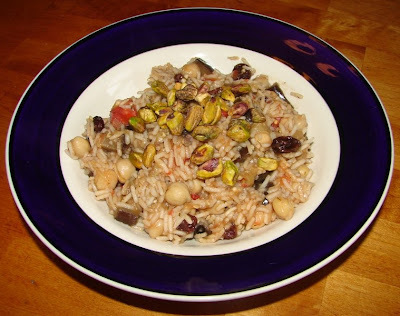 I love eggplant and pistachios, so when I saw this recipe for Turkish Rice Pilaf with Eggplants and Pistachios, I knew I would have to give it a try. Trim and discard stem end of eggplant. 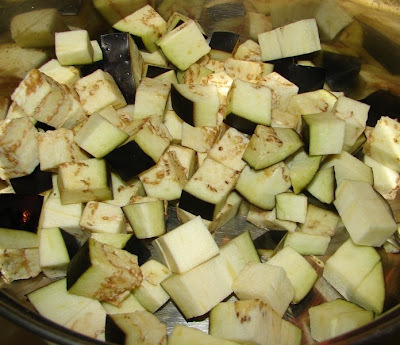 Cut unpeeled eggplant into 1/2-inch cubes and place the cubes in a colander. 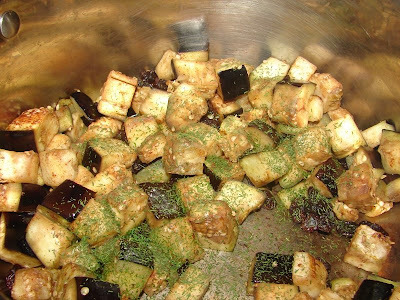 Sprinkle with 1 tablespoon of salt, tossing the eggplant to coat it evenly with the salt. Set in a sink to drain. Put the rice in a large bowl and fill the bowl with water. Swish the rice around and drain it. Repeat several times until the water runs clear. Cover the rice with water and set aside. Chop the onion into 1/2-inch dice. Combine in a large saucepan with olive oil and cook over medium-high heat for 5 minutes, stirring occasionally, until the onions have softened. Rinse eggplant well with running water and press it firmly in a cloth towel to squeeze out excess moisture and dry it well. Add it to the pan and increase heat to high. Cook eggplant and onions together, stirring occasionally, about 5 minutes. Drain the rice and add it to the pan. Chop raisins a little (don't be too obsessive about it) -- I love that the recipe author tells you not to be too obsessive :) -- and add them to the pan with 1 1/2 cups water, cinnamon, dill and 1 teaspoon salt. 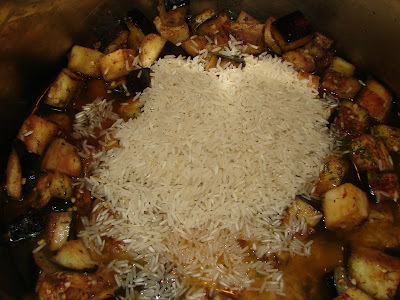 Put the top on the pan, lower heat to simmer and cook 15 minutes, or until rice is tender and the water is absorbed. Meanwhile, peel and core tomato, then chop into 1/2-inch dice. 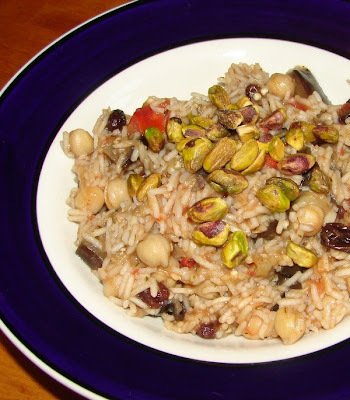 Five minutes before the rice is cooked through, add tomato and chickpeas and stir gently to combine. When the rice is done and the dish is heated, spoon into a serving bowl or onto individual plates. 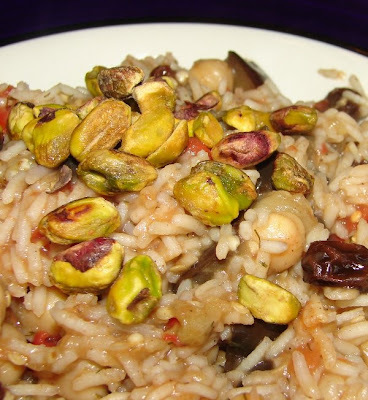 Top with pistachio nuts. Makes 2 to 4 servings as a main dish, 6 servings as a side dish. The first time I noticed a recipe for Parker House Rolls was in a Taste of Home cookbook years ago and I was drawn in by the butter and milk dough and how pillowy soft and fluffy they looked. I never did try that recipe, but I'm happy to report that Tyler Florence's version is just as delicious as I'd imagined Parker House Rolls to be. 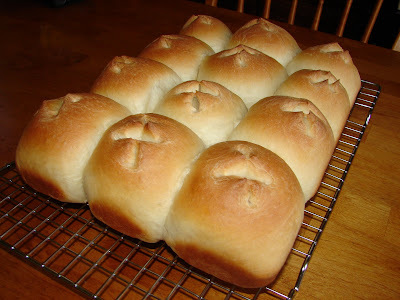 This is now our standard roll recipe and everyone loves them. 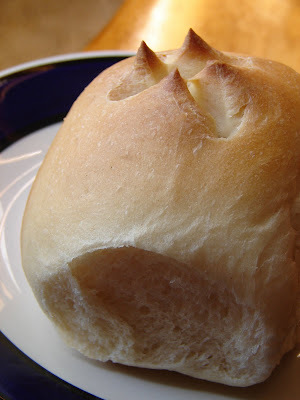 Even though this isn't a "bread machine recipe" -- I have to note that I've also tried this recipe in the bread machine starting on the dough cycle and finishing baking in the oven with wonderful results, which makes these perfect rolls even easier to prepare. 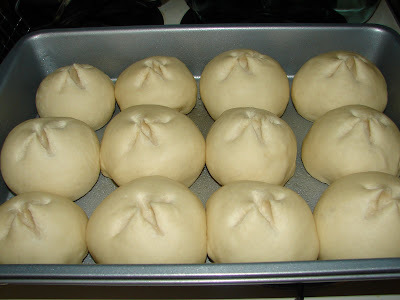 Turn out dough onto a lightly floured surface and knead five to six times until dough is smooth and elastic (do not overwork dough or rolls will be tough). 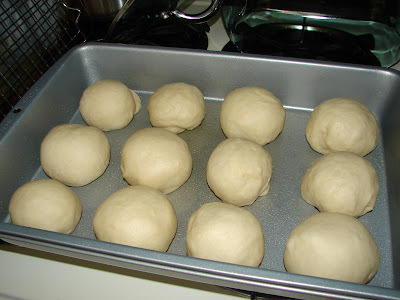 Form the dough into a ball and place in a greased bowl. Cover with a kitchen towel and set in a warm place for approximately 1 hour until the dough had doubled in volume. Butter a 9x5 inch baking dish. 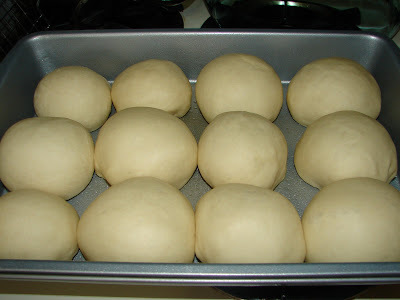 ( I used a 9 by 13, can't picture how they would turn out in a 9 by 5) Form the dough into 12 to 14 equal-sized balls. 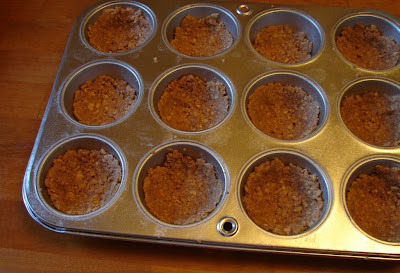 Arrange the balls in the baking dish so they are in rows just touching one another, then cover with a layer of plastic wrap, then the towel. Use a pair of kitchen scissors to snip the tops of each bun twice, forming an "x". Set aside for another 15 minutes. Meanwhile, preheat the oven to 375 (I did 350). Using a pastry brush, lightly brush the tops of the rolls with milk. Bake for 20 to 25 minutes, until golden brown. 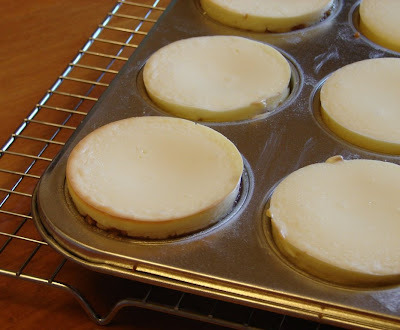 Let the rolls cool in the pan for 2-3 minutes before transferring them to a rack. Serve with butter. We have been doing many art activities to get ready for the Art Festival on May 7th. All families are invitied to attend. Here are some pictures of our art work. We made Earths for Earth Day, butterflies & caterpillars for our study of caterpillars and butterflies. Ms. Jaclyn showing the kids how to rub the crayon over their shoe to make the butterfly wings. We love our Earth paintings.